"The Gunner could take refuge in the thought that he was firing back, the driver could not. The driver went out conscious of the fact that he was defenceless in the face of enemy fire. For this reason his courage deserves special recognition." 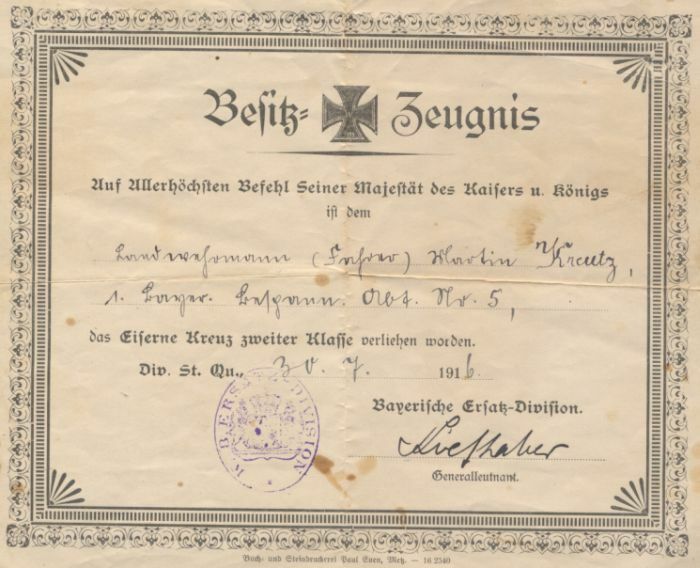 Above: Martin Kreutz's Iron Cross 2nd class award document. In an article published in 1927 the Bavarian General Beer paid tribute to the munitions columns behind the front at Verdun, a tribute that could apply to columns serving on all fronts. "During the battle for Verdun there was an essential artillery position in the valley stretching from Beaumont to Vacherauville (a length of four kilometres). On the eastern slopes of the valley there were approximately twenty batteries dug in out of view. The enemy on the facing heights was able to observe and fire accurately into the valley. Movement by day was impossible, all food and ammunition had to be moved by night. Until they reached the Northern entrance of the valley they travelled in formation - as no shells fell here. From this point single wagons sped down the valley in the direction of the batteries where the gunners jumped onto the wagons and unloaded them as they moved. Then a quick turn about and a gallop back up to the entrance of the valley. All done without light, four kilometres there and four kilometres back. Not one return trip, but up to five hundred trips a night would be done by the wagons of the supply column. It was a ride through hell. For men who fell from their wagons or horses, for horses that stumbled, wagons that overturned or were hit by a shell... there was no hope. What fell along the way was lost, and this unfortunately happened often. The valley with its churned up surface became a hideous sight to see and was christened the “Death ravine” ("Todesschlucht"). The "Death ride" was made not just once, but every night for half a year. Not once did a battery suffer shortages of food or ammunition due to the failure of a supply column." 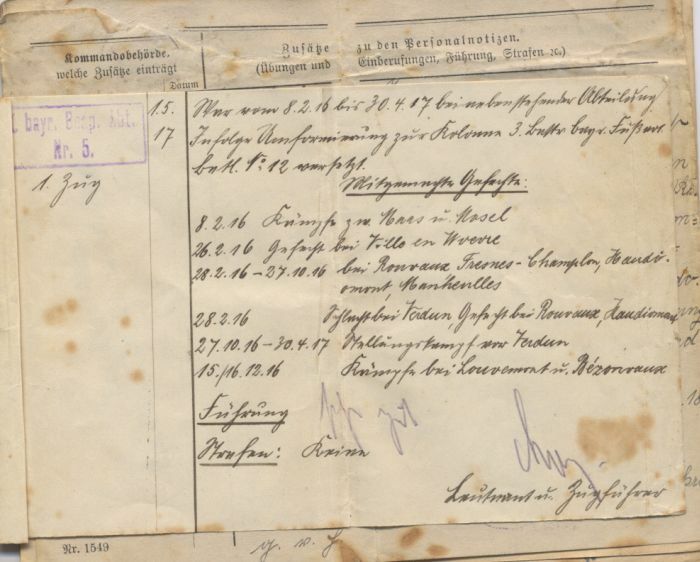 A page from Kreutz's military pass book showing his service up until the end of April 1917.